Martin Edwin Andersen is one example. 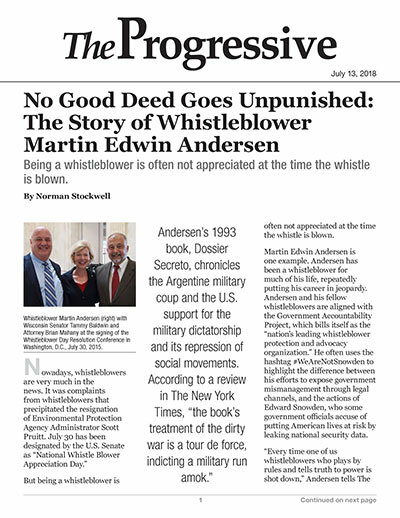 Andersen has been a whistleblower for much of his life, repeatedly putting his career in jeopardy. Andersen and his fellow whistleblowers are aligned with the Government Accountability Project, which bills itself as the “nation’s leading whistleblower protection and advocacy organization.” He often uses the hashtag #WeAreNotSnowden to highlight the difference between his efforts to expose government mismanagement through legal channels, and the actions of Edward Snowden, who some government officials accuse of putting American lives at risk by leaking national security data. “Every time one of us whistleblowers who plays by rules and tells truth to power is shot down,” Andersen tells The Progressive, “the bureaucratic swamp is essentially giving aid and comfort to Snowden” and others who choose to leak indiscriminately outside normal channels. Andersen’s most recent whistleblower complaint, which the Council of the Inspectors General Committee on Integrity met to review on July 12, has ostensibly been under review since at least 2012 by the Inspector General’s office of the U.S. Department of Defense. It includes charges that Honduran coup plotters received “behind-the-scenes assistance” from military officials in Washington, D.C., in 2009. These allegations stem from the period when Andersen was an assistant professor as well as the chief of strategic communications at the Center for Hemispheric Defense Studies, a U.S. Southern Command institute at the National Defense University (now called the William J. Perry Center). Anderson’s most recent complaint includes charges that plotters of the Honduran coup in 2009 received “behind-the-scenes assistance” from military officials in Washington, D.C.
To this day, according to Andersen, the Perry Center “still claims to enjoy an intimate institutional relationship with the coup-prone Honduran military.” Additionally, Andersen alleges a history of “racist, sexist, and anti-LGBT bigotry” at the center and the National Defense University. Andersen attended the University of Wisconsin and worked briefly for The Press Connection, an alternative newspaper created in 1977 by strikers at Madison’s two dailies. He went on to get masters’ degrees in international relations from the Johns Hopkins School of Advanced International Studies and in American and Latin American history from the Catholic University of America. He served as a former professional staff member on the U.S. Senate Foreign Relations Committee, and as a former senior advisor for policy planning at the Criminal Division of the U.S. Department of Justice. In 1997, he alleged that senior Justice Department officials mismanaged the training of foreign policemen and prosecutors, compromised intelligence secrets, and committed visa fraud in Russia. Andersen lost his job that year but was ordered to be rehired and eventually won his case in 2001 under the terms of the Whistleblower Protection Act. In July 2001, he also became the first national security whistleblower to receive the U.S. Office of Special Counsel’s “Public Servant Award.” In 2005, he was hired by the National Defense University in Washington, D.C., and later became an adjunct professor of history at the U.S. Naval Academy. Beginning in 2008, Andersen began to complain to his superiors at the National Defense University about a Chilean officer who had been a part of dictator Augusto Pinochet’s secret police, who was teaching at the Center. The officer, Jaime Garcia Covarrubias, is now back in Chile to stand trial for his alleged role in the torture and murder of seven unarmed detainees during the Pinochet regime. “The American people deserve to know that adequate vetting of such individuals would be routine,” Senator Patrick Leahy, Democrat of Vermont, told McClatchy News in 2015. Leahy was instrumental in getting the United States to restrict assistance to human-rights violating foreign security forces. During the same period, Andersen also questioned the behavior of another visiting Perry Center/National Defense University faculty member, Colombian General Carlos Ospina Ovalle, who is believed by some human rights groups to have participated in the repression of civilians in Colombia’s Antioquia region. Andersen reported in a December 2010 email to his superiors, walking into Ospina’s office, only to find him singing Cara al Sol, a Spanish fascist song, while giving a fascist salute. Andersen believes that, despite an “unbroken [record of] outstanding annual performance evaluations,” plus a personnel file containing letters of recommendation from his colleagues, he was pushed out of his job at the school for these complaints. Now, he awaits a resolution of his most recent whistleblowing efforts.